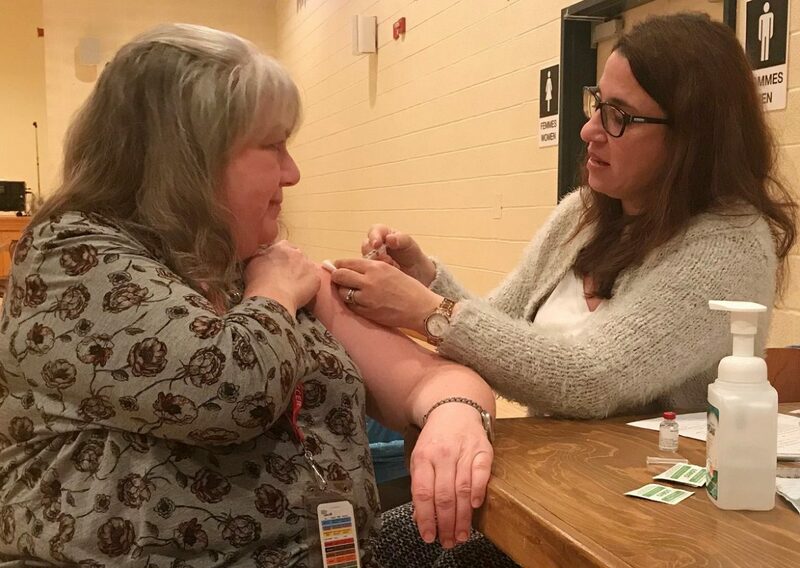 Melissa Wollow, an Administrative Agent with Technical Aids Service at Constance-Lethbridge Rehabilitation Centre, receives her annual flu vaccine from Silvana Perna, a nurse with Health, Safety and Well-Being. Influenza is an illness that can be serious, and potentially fatal. The Public Health Agency of Canada identifies the typical symptoms of the flu as fever, dry cough, muscle pain and a significant general malaise that lasts five to seven days. The cough can persist for two weeks, while fatigue sets in for several days. Complications can also follow a flu, such as earaches, sinusitis and pneumonia. The best way to prevent the flu is to get the flu vaccine, which is safe and effective. Throughout the month of November, flu vaccines will be available for all staff members across the network. To consult the vaccination schedule, visit our intranet Influenza page.